Sheetal A. Patel, Esq. is a member with Pasricha & Patel, LLC and has extensive experience in all aspects of immigration law. Sheetal, along with her talented staff of legal professionals, have many years of experience and are well known for their courteous and exemplary service to their clients. Sheetal provides businesses and individuals professional and dedicated legal services in all areas of employment-based immigration, labor certification, family-based immigration, and immigrant and nonimmigrant visa petitions. Sheetal successfully represents clients from diversified industries including information technology, startups, finance, healthcare, pharmaceutical, medical, universities, hospitality management, restaurants and retail businesses. She also handles complex employment-based applications, waiver cases, and administrative motions and appeals. She represents clients with respect to compliance matters including audits. 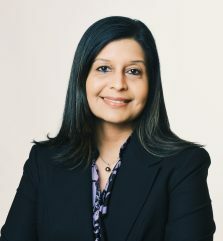 Sheetal provides comprehensive counsel to families and individuals, utilizing her family law experience to assist clients with immigration issues arising out of legal separation or divorce. Frequently, this includes VAWA self petitions (Violence Against Women Act) and removal of conditional residence waivers. Sheetal is passionate about her involvement in the community. She donates significant time and resources to help victims of abuse, especially women and children. Sheetal is on the Board of Directors for Unchained at Last, a non-profit organization that is dedicated to helping women and girls avoid and escape forced marriages. She also volunteers with Manavi, a non-profit organization that seeks to end violence against women of South Asian descent. Her dedication to her profession and community is the source of Sheetal’s well earned respect and trust.